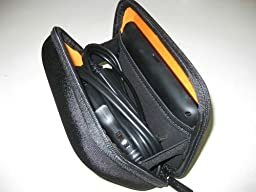 "This Best Selling AmazonBasics Hard Carrying Case for 5-Inch GPS – Black Tends to SELL OUT VERY FAST! If this is a MUST HAVE product, be sure to Order Now at Amazon.com to avoid disappointment!" What customers say about AmazonBasics Hard Carrying Case for 5-Inch GPS – Black? I was expecting a smaller case just for the nuvi but I’ve found that it can accommodate both the nuvi (in the mesh pocket) and the power cord. For the past year or so, I’ve been carting around my GPS unit in a high-quality zippered nylon bag originally sent with the PSU that I put into my CPU tower about two years ago. I had been carrying my GPS in that pouch for two reasons: first, if I happened to leave it in a visible spot in my car, most people wouldn’t expect a PSU pouch meant for carrying extra wires and cords to contain a GPS, thus removing the theft-worthiness of it at first glance; and, second, I still wanted to provide my glass touchscreen GPS with at least moderate protection when I threw it in my handbag. That Fatal1ty pouch covered both of those bases, but me being the picky person I can be, I just wasn’t thrilled that the pouch wasn’t a perfect fit for my GPS. Enter this zippered “hard” case by Amazon. Honestly, I can’t imagine that any branded product sold by or for GPS makers could be any better suited to comfortably holding your 5″ GPS unit. The interior is clean and simple, with a mesh pouch built into one side, and an entirely open side for the other half of the clamshell-style case. The sides are attached with short but wide elastic strips that prevent the case from opening too far, and the interior is lined with a flocked, pumpkin-colored fabric. My only slight qualm with this case is its page declaration that it’s a “hard” case. As my subject heading says, it’s more along the lines of a “firm” case, IMHO. The sides are clearly formed of some sort of reinforced cardboard-weight substance, but I’m not even sure that that’s made of plastic pieces, because of the give from it when I poke a side. So, while this case DOES give my GPS better protection than my old modular PSU cable pouch did, I can’t say that I really consider it to be a hard case. I can easily see the sides giving in if this case were to get squished in my purse (of course, considering all the crap I tend to carry in my oversized purses at any given time, that’s not really a big surprise in MY case). So, overall, I’m glad I’ve got this case for my GPS. It DOES provide more protection than my old method did, and the Amazon-branded product is just as good as anything else out there, but it’s not truly a hard case in my opinion. It’s spacious enough to hold the GPS unit within the pouch, with no loose rattling around of it in there, while also holding the power cable in the open side, but my suction cup windshield mount does NOT fit in the case with everything else in there. Does the job at a reasonable price, and well, so if this case is cheaper than the others you’re considering for protecting your GPS, I give it a hearty thumbs-up, but if you see something else offered at a lower price, I would be hard-pressed to say that this item would do a better job of protecting it than any other “hard” GPS case. Go with the cheapest option, be it this case, or another. I would expect the level of protection to be the same, either way. The case is large enough to store the car adaptor cord and the 5″ system. It is sturdy enough to withstand bumps.